"This is a very easy recipe to make and very yummy as well." Trim the coarse ends of the asparagus and cut asparagus into one inch pieces. In a medium skillet over medium high heat, saute the asparagus in 1 cup of the broth for about 7 minutes, or until tender. In a large saucepan over medium high heat, melt the butter or margarine and remove from heat. Add the flour and stir well until smooth. Gradually add the remaining 2 1/2 cups broth. Return the saucepan to the heat and continue to cook, stirring occasionally, until slightly thickened. Add the half-and-half, salt, pepper and cooked asparagus with liquid. Stir well and heat thoroughly. Serve hot and enjoy! 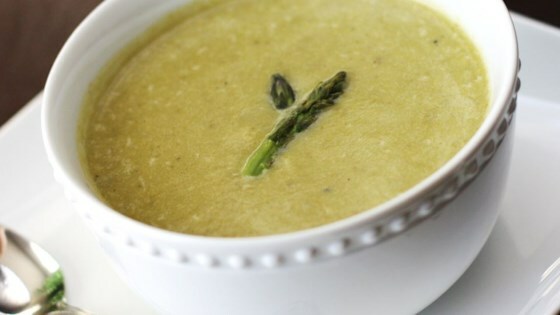 See how Chef John makes creamy fresh asparagus soup.